It’s been a long wait since we last saw a CthulhuTech book–Unveiled Threats last fall, which contrary to what its name implies was a large book of guns and artifacts–so it’s about time we see another release from Wildfire. In this case, it’s Chthonian Stars, a Cthulhu Mythos (big surprise) game using the Traveller license. (Notably little relation to hypothetical chthonian planets, or Brian Lumley’s Mythos race.) Maybe it’s because I’ve been reading too much SF lately, but the Traveller part alone was enough to grab my interest. The new Traveller is being published by Mongoose Publishing, of all people. My opinion of Mongoose isn’t terribly high, partly because of their hit-or-miss-and-generally-miss d20 products (Slayer’s Guides Say What). That said, I also held that opinion for Fantasy Flight Games (Legends & Lairs Say What), another publisher of early d20 over-bloat, and their handling of the Warhammer 40k RPG lines has me eating crow. Mongoose’s new Traveller line has been pretty top-notch–the Hammer’s Slammers book was a blast, and they have a good selection of Babylon 5 supplements–and they’re also running the new RuneQuest game, which is slick as all hell. So, Chthonian Stars. The game line has been mentioned a few times in the past years, and finally released this spring in .pdf form. Now it turns out that Wildfire decided it wasn’t going with Mongoose Traveller after all, for reasons which never really got explained; probably for the best, since while I like the Mongoose Traveller rules, I’m not sure I’ll either buy them or use them. 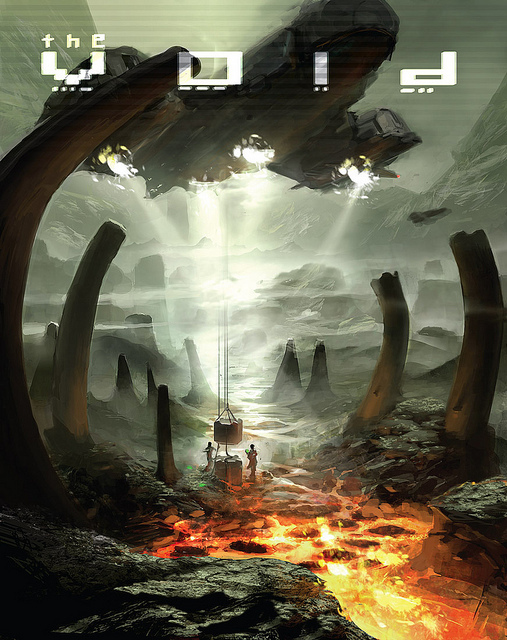 Wildfire is be renaming the game as The Void, giving it a new rules system (please, please, please either be Framewerk so I can use it with CthulhuTech, or that wonky percentile system so I can use it with Eclipse Phase), and releasing it as a 6″x9″ softcover sometime in the near future. As the Mongoose Traveller edition was mostly complete, they put it on the market in .pdf form with its Chthonian Stars name; for simplicity’s sake (e.g., laziness), that’s how I’ll be referring to it. And now, the game itself. Again, so there is no misunderstanding: I like the new Mongoose Traveller system, and Chthonian Stars fits onto it nicely. The game is set sometime in the near future, the year 2159, after man has developed space travel and is beginning to colonize the galaxy. In the middle of this, a large glob of dark matter is seen hurtling towards earth, and things start going Lovecraftian: cults rise up, “dead” moons spring to life, weird horrors emerge, and the end-times are upon us. Chthonian Stars is the game of Lovecraftian entities (and other strangeness) rising up, while humanity is still exploring its own galaxy. This setting, and world, is awesome: imagine Alien, or Pandorum, or Event Horizon, then throw in some exploration and space hulk for good measure. Terror aboard starships in the first age of space, as it were. It’s a perfect setting for Cthulhu-brand horror because it already has the “isolated on the fringes of a new frontier” quality to it, with mining facilities and terraforming colonies dangling far off, unprotected, as the Lovecraftian horrors creep in. The book has a lot of crunch to add to any Traveller game, including a dozen near careers, fear and insanity checks, a section on atmospheres and environments, a large chapter with new weapons and equipment, and sixteen Lovecraftian creatures, with many returning favorites and a few new critters. My favorite part is the starship section, with starship creation rules and ten example spaceships (including deck plans). The general feel is near future, without any FTL travel, artificial gravity, or other far-future tech; most of the weapons are still slugthrowers, and while there’s no laser weaponry there are mono-filament whips. Very much a hard-SF setting, near-future low-tech, even for Traveller. There’s a substantial amount of material here, but to be honest, not much of it is Mythos-related: the fear and insanity rules are good, but short, and there’s not much variety in the results. (Maybe I’m spoiled by Deadlands’ impressive fear chart.) The section on environment/atmosphere is good, but again, I’d like to see more; I didn’t even see much game crunch on these, like protective suits beyond vacuum survival gear. How do the colonists survive a gas giant’s atmosphere, anyways, or the crushing pressures and winds of Venus? The list of Mythos entities is good, covering most of the traditional foes, but even with some new monsters the list is rather uniform compared to CthulhuTech or CoC (mostly bipeds or worm-like things that you hit with guns until they fall down). The lack of shoggoths is appalling. There are a few cool monsters, such as the Karrak’in (metal-eating scavengers/rust monsters, that’s a scary thought for anyone in a starship), the Myriad (bad urges you give the players, until they become puppets to a host parasite in their bloodstream), and the Nyphelous (who eat fear and put their victims in a nightmare hallucination). And while cult emergence is a major theme of the game, I had to check the index to find information on the different cults. Needless to say, it was buried in the middle of the Secrets chapter. I get that they’re emerging and therefore relatively unknown, but having cult info near the cultist bestiary entry was way helpful for CthulhuTech. As the third book is titled “Ecological Footprint,” and the second “Horrors of the Void,” I’m hoping these nitpicks about insufficient content will be rectified via sourcebooks. There’s also a great deal of fluff, so the book can definitely be used with something other than Traveller. There’s around twenty pages of backstory, namely history and details about the current situation, the world government and chthonian star and all that. There’s also a slick chapter dealing with all the celestial objects in our galaxy, including overviews, descriptions, and details about their colonies and colony life. Each planet isn’t overly detailed, but isn’t overly long, either. The equipment chapter starts off with a large section on technology, from medicine to terraforming to transport, which is both interesting fluff and useful game knowledge. The art is top notch, and highly reminiscent of CthulhuTech; it’s scaled down from epic mecha-anime action, and conveys a similar, grittier, tone. 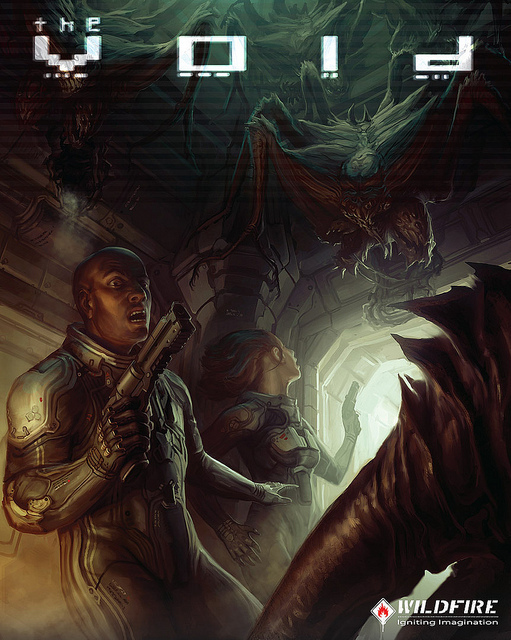 Just as with CthulhuTech, there is a substantial amount of game fiction. Just as with CthulhuTech, I don’t generally read it. Near the end is a small chapter “for referees;” it mentions that Traveller and Chthonian Stars are not beginner games, and thus the devs assume that GMs are experienced, and then runs into a recap of traditional story arcs and Lovecraftian themes. It’s not long, getting across the info for new GMs unfamiliar with the concepts without wasting space. The chapter ends with two high points: a list of rumors, three per planet, and a trio of plot hooks. For the most part, these are all really good, but the section is short. There’s also a chapter of “secrets,” exposing a lot of interesting background elements and part of the plot; essentially, this chapter explains the history of the universe and how the Old Ones relate to what’s happening. As such, it’s one of the most interesting (and important) in the book. 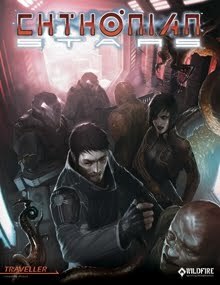 According to the developers, Chthonian Stars is the first in a series of six books detailing the story/plot; from the introduction, these form the Cthulhu Saga, “a series of games that take place in the same universe and the same time-line, each highlighting an exciting era.” My first thought being Didn’t I already buy this game when it was called CthulhuTech? Which is still only partway into its six-book metaplot, by the way. Though I should note CthulhuTech was more multiple books within a single metaplot and not multiple eras within a single setting. Anyways, I have a love-hate relationship with heavy-metaplot games, “story-setting” games, etc. In other words, books that have a high crunch:story ratio. I’m fine with a high crunch:fluff ratio, but tying a gameline to a single story arc feels too constricting. Scion was the worst offender, but Brave New Worlds comes to mind, as does most of the Savage Worlds books. CthulhuTech is a good example; most of my gamer friends were chomping at the bit to get a hold of it, and most stopped at Vade Mecum. Why? Because Damnation View costs forty bucks, and has comparatively limited use. Basically: with an adventure/story/plot book, you can use it as written, or you don’t use it at all. Sure, you can use a story book it to inspire your own ideas, but compare dropping $40 on a narrow-focus book compared to something that adds in new material that would see plenty of use (e.g., Vade Mecum, Ancient Enemies). That all said, I’m hoping Chthonian Stars jumps that gap by virtue of offering different eras instead of being “what happened last year” sourcebooks. I can see that becoming an awesome series, with each book recapping the last few decades of exploration and warfare, so that the different eras have different play styles, themes, tech levels, etc. As noted, Chthonian Stars is pretty low-tech near-future, with slugthrowers, no FTL, no artificial gravity, and near-earth colonies. A good series of setting-era books can add in new tech developments, chart the rise of the cults, show how the blossoming “dead” planets develop. Here’s the first incursion against our early space colonies, and here’s how galaxy-spanning transhumanist post-future is built out of the rubble of Cthulhu-wracked Old Earth. That kind of thing. My only other complaint about the book is that it doesn’t add in anything really new in terms of mechanics and Mythos. Sure, there’s a few new monsters between the bholes and the star-spawn, but if you’ve played a Cthulhu-based game lately it’ll look pretty familiar. If you’re a fan of both Lovecraft and Mongoose Traveller, having staples like fear and madness checks can be helpful, but it’s a Lovecraft standard at this point. (Personally, I’d like the chart to be expanded a bit more; it’s only a page or so in the book, when space has so much fear and madness to give–isolation, vacuum, starvation, lack of oxygen, paranoia.) This isn’t so much a fault with the book, but the overall glut of Lovecraft-themed games that have cropped up in the last five years: Trail of Cthulhu, CthulhuTech, Chthonian Stars, Cthulhu for Savage Worlds, Cthulhu for True20, Mythos monsters in Pathfinder, Cthulhu creatures for 4e, great new settings for ye olde Call of Cthulhu… While Chthonian Stars works wonders with its setting and story, there’s really not much to differentiate it from the herd in terms of crunch and mechanics. All told, Chthonian Stars is pretty solid. There’s a lot of meat to the world already, and a lot of “looming terrors and plots to be expanded and explained in the next six books,” and I’m looking forward to seeing things develop as The Void. Chthonian Stars has a lot of similarities to CthulhuTech, in that it’s a successful blend of one form of SF (Traveller’s space opera) with Lovecraft. I love CthulhuTech, but the game had some notable problems–its driving “six-book metaplot,” which I’d note hasn’t been touched since 2009’s Damnation View–and I’m hoping Chthonian Stars will avoid the same pitfalls. At the same time, I don’t think it’s fair to compare the two game lines. CthulhuTech is over the top anime mecha action, while Chthonian Stars is brooding stellar horror, dark things infesting dark places, space hulk and madness. It’s a great setting to inject Cthulhu into, and Wildfire pulled it off with the same top-notch flair as their previous Cthulhu-related line. not convinced by this setting. In comparison of Cthulhutech and his handful of supplements, I prefer a more modern approach of sci-fi, like Eclipse phase or Transhuman space, or Fading suns. And my players likes Framewerk and other more complexe systems. So, Chthonian stars is good, but don’t inspire my team.